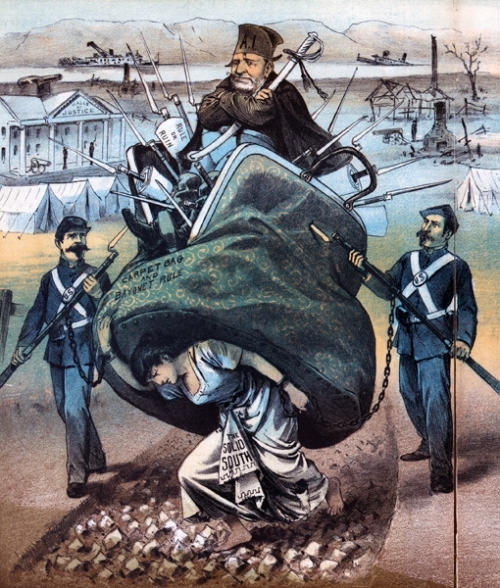 Wikipedia: In modern usage in the U.S., the term “carpetbagger” is sometimes used derisively to refer to a politician who runs for public office in an area where he or she does not have deep community ties, or has lived only for a short time. Lee County’s most influential, controversial and outspoken public official will not seek a second term on the board of commissioners, The Sanford Herald reported today. His decision puts an end to one of the most interesting political tenures Lee County has ever seen. A relative unknown when he announced his run in spring 2010, Womack was part of the Republican wave that dominated the election that year in North Carolina and nationwide. As the new leaders in Raleigh began gutting the social infrastructure of the state, Womack and Co. focused on county property taxes and the school system. After getting off on the wrong foot — the new conservative board’s first big vote was approving a $10,000 pay bonus to the county manager, a move that confused local Tea Party loyalists — the new majority focused on budget cuts. In 2013, the commissioners lowered Lee County’s property tax from 75 cents per $100 valuation to 72 cents. But Womack will also be remembered for his public clashes with the school board (click HERE and HERE, too), his off-the-cuff emails about running over the county manager with a tank and firing the county attorney and his “anonymous” blog, which began during his candidacy in 2010 and continued three years into his tenure as commissioner. The blog was the focus of a big piece in the Independent Weekly in 2013, an article that pointed out multiple incendiary comments against local, state and national Democratic officials. Womack’s departure may signal the end of Republican rule on the county board for the next term, at least. Joining Jim out the door is Republican Board Chairman Charlie Parks; and running in their places this November will be newcomer Chris Delambert and Siler City police officer Kevin Dodson. Though one can argue that “end” began in 2012, when all three Republicans running that year received fewer votes than the two Democrats, Amy Dalrymple and Ricky Frazier. The Lee County Democratic Party failed to run a third candidate that year (independent Ron Hewett finished last), so Kirk Smith (the top vote-getting Republican who finished third) won a seat by default. What else does it mean? Well … The Rant just got a whole lot less interesting. Good luck, Jim. I guess we’ll see you in 2015 when you’re appointed to replace a Republican who has suddenly decided to step down. Great article .One bully that will not be missed . Not that we will be lucky enough for him not to still try to rule through his sidekick . Plus , we still will have him at the MEC ,bullying NC around though. It is so good to see him exit Lee County politics, at least in an official capacity. Suppose his warped sense of service can remain on the fringes. I hope Lee County voters have some sense of his damage and danger and will think when they vote in the future. Womack did not go voluntarily–he had his tracks yanked. In fact, he has not really gone anywhere. He may be absent on the ballot but he will still be at the heart of the election. Those in Raleigh who do not want the tsunami-size rejection of Womack and minions to drown Mike Stone have gained little ground. Womack cannot stop himself from being who he is. For all his biblical references at some point he is going to see a betrayal and pull the columns down on every one. If he won’t have it, no one else will. And just wait to the election debacle is over. He will claim That had he been able to carry his flag down Steele Street, he and this ticket would have swept to victory. Off the ticket is not enough and out of town won’t be far enough, either. I can just see Womack being appointed to some position where he can continue his push to frack the state. Keith Clark, I agree. He cannot stop himself from being who he is. If he could, some of his Christian counselors would have surely been able to help him. Go Womack! Frack the state…make NC prosperous like the other states that have fracking and have NOT DESTROYED the environment. You poor liberals. Good-bye & good riddance! Arkansas needs you; not NC!!! !